Liczba stron: 687 Jest to ujednolicona liczba stron, która ułatwi Ci porównanie długości książek. Każda strona Legimi to 200 słów. 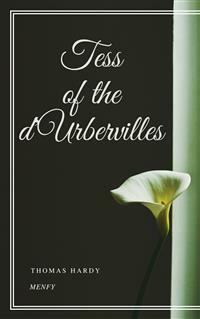 Young Tess Durbeyfield attempts to restore her family's fortunes by claiming their connection with the aristocratic d'Urbervilles. But Alec d'Urberville is a rich wastrel who seduces her and makes her life miserable. When Tess meets Angel Clare, she is offered true love and happiness, but her past catches up with her and she faces an agonizing moral choice.Hardy's indictment of society's double standards, and his depiction of Tess as "a pure woman," caused controversy in his day and has held the imagination of readers ever since. Hardy thought it his finest novel, and Tess the most deeply felt character he ever created. Thomas Hardy, OM (2 June 1840 – 11 January 1928) was an English novelist, short story writer, and poet of the naturalist movement. The bulk of his work, set mainly in the semi-imaginary county of Wessex, delineates characters struggling against their passions and circumstances. Hardy's poetry, first published in his fifties, has come to be as well regarded as his novels, especially after the 1960s Movement. It is a vale whose acquaintance is best made by viewing it from the summits of the hills that surround it—except perhaps during the droughts of summer. An unguided ramble into its recesses in bad weather is apt to engender dissatisfaction with its narrow, tortuous, and miry ways. The banded ones were all dressed in white gowns—a gay survival from Old Style days, when cheerfulness and May-time were synonyms—days before the habit of taking long views had reduced emotions to a monotonous average. Their first exhibition of themselves was in a processional march of two and two round the parish. Ideal and real clashed slightly as the sun lit up their figures against the green hedges and creeper-laced house-fronts; for, though the whole troop wore white garments, no two whites were alike among them. Some approached pure blanching; some had a bluish pallor; some worn by the older characters (which had possibly lain by folded for many a year) inclined to a cadaverous tint, and to a Georgian style. The clubbists tittered, except the girl called Tess—in whom a slow heat seemed to rise at the sense that her father was making himself foolish in their eyes. "I am inclined to go and have a fling with them. Why not all of us—just for a minute or two—it will not detain us long?" "No—no; nonsense!" said the first. "Dancing in public with a troop of country hoydens—suppose we should be seen! Come along, or it will be dark before we get to Stourcastle, and there's no place we can sleep at nearer than that; besides, we must get through another chapter of A Counterblast to Agnosticism before we turn in, now I have taken the trouble to bring the book." "All right—I'll overtake you and Cuthbert in five minutes; don't stop; I give my word that I will, Felix." "'Ssh—don't be so for'ard!" said a shyer girl. The church clock struck, when suddenly the student said that he must leave—he had been forgetting himself—he had to join his companions. As he fell out of the dance his eyes lighted on Tess Durbeyfield, whose own large orbs wore, to tell the truth, the faintest aspect of reproach that he had not chosen her. He, too, was sorry then that, owing to her backwardness, he had not observed her; and with that in his mind he left the pasture. She remained with her comrades till dusk, and participated with a certain zest in the dancing; though, being heart-whole as yet, she enjoyed treading a measure purely for its own sake; little divining when she saw "the soft torments, the bitter sweets, the pleasing pains, and the agreeable distresses" of those girls who had been wooed and won, what she herself was capable of in that kind. The struggles and wrangles of the lads for her hand in a jig were an amusement to her—no more; and when they became fierce she rebuked them. Come, love!? and I'll tell? you where!? The interior, in spite of the melody, struck upon the girl's senses with an unspeakable dreariness. From the holiday gaieties of the field—the white gowns, the nosegays, the willow-wands, the whirling movements on the green, the flash of gentle sentiment towards the stranger—to the yellow melancholy of this one-candled spectacle, what a step! Besides the jar of contrast there came to her a chill self-reproach that she had not returned sooner, to help her mother in these domesticities, instead of indulging herself out-of-doors. There stood her mother amid the group of children, as Tess had left her, hanging over the Monday washing-tub, which had now, as always, lingered on to the end of the week. Out of that tub had come the day before—Tess felt it with a dreadful sting of remorse—the very white frock upon her back which she had so carelessly greened about the skirt on the damping grass—which had been wrung up and ironed by her mother's own hands. "That wer all a part of the larry! We've been found to be the greatest gentlefolk in the whole county—reaching all back long before Oliver Grumble's time—to the days of the Pagan Turks—with monuments, and vaults, and crests, and 'scutcheons, and the Lord knows what all. In Saint Charles's days we was made Knights o' the Royal Oak, our real name being d'Urberville! … Don't that make your bosom plim? 'Twas on this account that your father rode home in the vlee; not because he'd been drinking, as people supposed." Her mother gave irrelevant information by way of answer: "He called to see the doctor to-day in Shaston. It is not consumption at all, it seems. It is fat round his heart, 'a says. There, it is like this." Joan Durbeyfield, as she spoke, curved a sodden thumb and forefinger to the shape of the letter C, and used the other forefinger as a pointer. "'At the present moment,' he says to your father, 'your heart is enclosed all round there, and all round there; this space is still open,' 'a says. 'As soon as it do meet, so,'"—Mrs Durbeyfield closed her fingers into a circle complete—"'off you will go like a shadder, Mr Durbeyfield,' 'a says. 'You mid last ten years; you mid go off in ten months, or ten days.'" Her mother put on a deprecating look. "Now don't you be bursting out angry! The poor man—he felt so rafted after his uplifting by the pa'son's news—that he went up to Rolliver's half an hour ago. He do want to get up his strength for his journey to-morrow with that load of beehives, which must be delivered, family or no. He'll have to start shortly after twelve to-night, as the distance is so long." All these young souls were passengers in the Durbeyfield ship—entirely dependent on the judgement of the two Durbeyfield adults for their pleasures, their necessities, their health, even their existence. If the heads of the Durbeyfield household chose to sail into difficulty, disaster, starvation, disease, degradation, death, thither were these half-dozen little captives under hatches compelled to sail with them—six helpless creatures, who had never been asked if they wished for life on any terms, much less if they wished for it on such hard conditions as were involved in being of the shiftless house of Durbeyfield. Some people would like to know whence the poet whose philosophy is in these days deemed as profound and trustworthy as his song is breezy and pure, gets his authority for speaking of "Nature's holy plan." "Abraham," she said to her little brother, "do you put on your hat—you bain't afraid?—and go up to Rolliver's, and see what has gone wi' father and mother." "—Being a few private friends I've asked in to keep up club-walking at my own expense," the landlady exclaimed at the sound of footsteps, as glibly as a child repeating the Catechism, while she peered over the stairs. "Oh, 'tis you, Mrs Durbeyfield—Lard—how you frightened me!—I thought it might be some gaffer sent by Gover'ment." "I've something to tell 'ee that's come into my head about that—a grand projick!" whispered his cheerful wife. "Here, John, don't 'ee see me?" She nudged him, while he, looking through her as through a window-pane, went on with his recitative. "Yes—in a way. D'ye think there's any money hanging by it?" "Hey—what's that?" said Sir John. "There is a lady of the name, now you mention it," said Durbeyfield. "Pa'son Tringham didn't think of that. But she's nothing beside we—a junior branch of us, no doubt, hailing long since King Norman's day." "How do you come here, child? What nonsense be ye talking! Go away, and play on the stairs till father and mother be ready! … Well, Tess ought to go to this other member of our family. She'd be sure to win the lady—Tess would; and likely enough 'twould lead to some noble gentleman marrying her. In short, I know it." "I tried her fate in the Fortune-Teller, and it brought out that very thing! … You should ha' seen how pretty she looked to-day; her skin is as sumple as a duchess'." "—Being a few private friends asked in to-night to keep up club-walking at my own expense." The landlady had rapidly re-used the formula she kept on hand for intruders before she recognized that the newcomer was Tess. "I've got a fam—ily vault at Kingsbere!" "Hush—don't be so silly, Jacky," said his wife. "Yours is not the only family that was of 'count in wold days. Look at the Anktells, and Horseys, and the Tringhams themselves—gone to seed a'most as much as you—though you was bigger folks than they, that's true. Thank God, I was never of no family, and have nothing to be ashamed of in that way!" Tess turned the subject by saying what was far more prominent in her own mind at the moment than thoughts of her ancestry—"I am afraid father won't be able to take the journey with the beehives to-morrow so early." "I? I shall be all right in an hour or two," said Durbeyfield. "O no—I wouldn't have it for the world!" declared Tess proudly. "And letting everybody know the reason—such a thing to be ashamed of! I think I could go if Abraham could go with me to kip me company." "I don't know; but I think so. They sometimes seem to be like the apples on our stubbard-tree. Most of them splendid and sound—a few blighted." "Which do we live on—a splendid one or a blighted one?" "O Aby, don't—don't talk of that any more!" The lantern hanging at her waggon had gone out, but another was shining in her face—much brighter than her own had been. Something terrible had happened. The harness was entangled with an object which blocked the way. "'Tis all my doing—all mine!" the girl cried, gazing at the spectacle. "No excuse for me—none. What will mother and father live on now? Aby, Aby!" She shook the child, who had slept soundly through the whole disaster. "We can't go on with our load—Prince is killed!" "No," said he stoically, "I won't sell his old body. When we d'Urbervilles was knights in the land, we didn't sell our chargers for cat's meat. Let 'em keep their shillings! He've served me well in his lifetime, and I won't part from him now."